There’s a lot of hurting and pain in the world. Just in case you weren’t already aware. And sometimes people respond to that hurt and pain with a whole lot of anger and pointing fingers and insisting that people who are speaking against what they believe need to be condemned. They point at them and vent their anger in an effort to…..
Ummm, okay, I think they might be going at it all wrong. I read this article that I’ve thought about today–“It’s Okay to Eat Lucky Charms for Dinner.” I really like what Alice Seuffert had to say. Sometimes when the news is more than her heart can bear, she brings home Lucky Charms to have for supper. And so that’s how I found myself making pancakes for the crew tonight. It was a good day really. A swim meet where our Princess did her best and had a great time and actually surpassed her personal bests in all her events. The smile on her tired face when it was over said it all. Despite the joy of today, what has weighed heavily on my heart is the dream I woke up from in the dark just before dawn. It was a hard one. My family and I were on some kind of trip, in a place where we’d never been before. We were on some kind of open air trolley, and suddenly it stopped. People started running, so of course we got the children off the trolley and ran…..away. Away from people yelling and the gunshots that followed. Young men in their teens were running around with guns shooting everywhere. In our terror, we ran toward some trailers that resembled my first and second grade classrooms. We ran behind some for protection and found another one. Outside of it was a comforting soul, a woman whose presence was soothing and reassuring. She looked a lot like the priest I met at the vigil on Monday night. She pointed toward the door on the porch of the trailer. She told us to get in quickly, and then she was gone. We moved quickly up the steps and towards the door as I saw out of the corner of my eye a woman with dark hair standing quietly and alone on the other corner of the porch. Once inside, we breathed deeply and with relief. I looked around and immediately my children were relaxed alongside others. Right behind us, the woman with the dark hair came in quietly behind us and closed the door. I started to worry, and then two things occurred to me. The first was that in my other-conscious state (you know, the part of you that knows it is a dream–that happens when I’m about to come out of one), I knew she looked very much like a woman who has been in the news a lot this past week. A woman whose sentencing hearing has caused a lot of anger and finger pointing and hurt. Before I could be afraid, I was offered peace and I took it. Suddenly I just knew we were all safe, and that it wasn’t for me to keep her out of this place where we could find peace and safety and comfort. It wasn’t for me to lock the door and keep her out. Just the opposite in fact. Because we hadn’t locked it, she was able to find her way in herself. Yeah. It was with those words and thoughts on my heart, and wondering if I’m going to be able to live those words out in my own real life, that I went through my day. Life is hard, y’all. But I’m guessing you know that. I’m guessing you could tell me some stories about how hard it is. Whether it makes sense or not, it is easier for me to forgive someone whose story I hear than it is for me to forgive someone whose actions have crossed my own story and changed its course. Even when the former one’s actions are far more damaging and permanent and violent than the latter. I know. It doesn’t make sense, but there it is. The much used page from my Aunt Bee’s Mayberry Cookbook by Ken Beck. I was going to post a picture of the pancakes, but I was too late because, well, pancakes. So in all of those thoughts, I thought about the Lucky Charms as comfort food, and since I was too–I’ll just say it–lazy to go to the store this afternoon, I made pancakes. 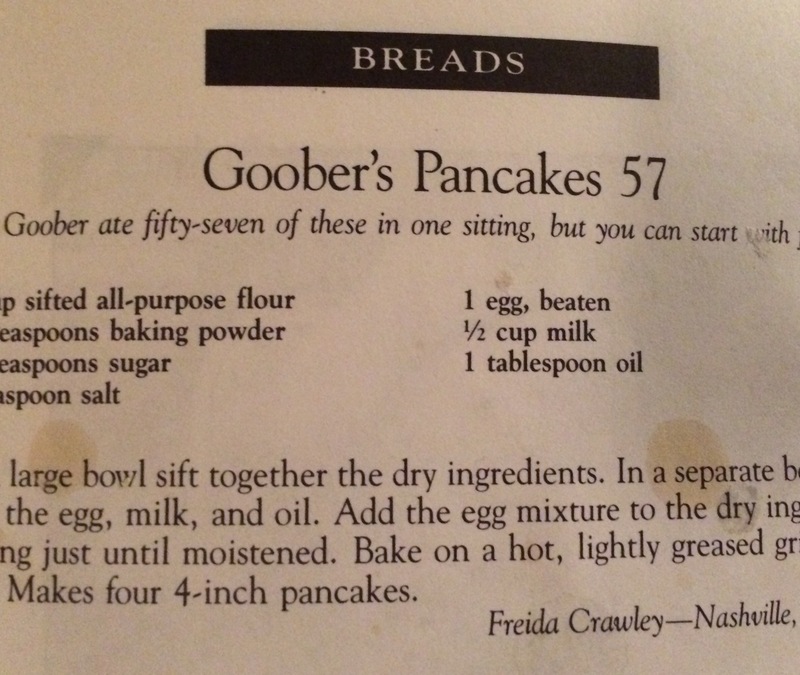 Goober’s Pancakes 57 from Aunt Bee’s Mayberry Cookbook. They are legendary in our house. Not because they’re phenomenal or anything, but because my crew knows Goober’s story. I’m glad they know his story. All too soon the other stories will find them. The dark ones. The ones that will cause them to struggle with what they thought they knew, with all the grey of right and wrong and everything in between. The ones that will challenge them to be forgiving and loving and leave the judging up to only One. For now, the stories that make us smile and laugh and feel like home are just fine. May you all have someone to eat pancakes or Lucky Charms with and to bring you comfort when the darkness threatens to envelop you. ********You can get your own copy of Aunt Bee’s Mayberry Cookbook by clicking on the title above. Even if you never cook, you will enjoy reading it. There’s even a recipe for her Kerosene Pickles! Tara I’m thankful for the connection and the comfort in knowing we both tackle the ugly with comfort food. Yes, let’s share pancakes and Lucky Charms with the ones we love and find comfort. Many thanks for sharing. Alice, thank you for sharing your thoughts that so many of us needed to hear. They came at a time when I needed the grace to feed my family comfort food and give thanks for being lucky in the midst of all the brokenness in our world. Thank you for stopping by and reading. I hope you will come again. Best wishes.